We have over fifteen years of experience shipping our tools and supplies to almost every country in the World. Every shipment is carefully reviewed and packaged to ensure fast and safe delivery. Shipping costs are automatically calculated on our website by UPS or USPS when you add items to the shopping cart. Costs are based on the overall weight of your order, and in some cases, the size of the items being shipped. We never inflate the cost of shipping or add hidden surcharges, we do, however discount the shipping costs to keep them competitive. The shipping fees you see are typically discounted 20-30%. The shipping rates displayed on our website are the actual rates supplied by UPS or USPS based on the contents of your shopping cart. Due to their size, some items such as rail, BullFrog control rods and FreightCrates, these items will be shipped in a separate boxes. It is not unusual for boxes from the same shipment to get separated and arrive on different days. Shipping fees do not include duties, import fees, brokerage fees or taxes. All fees above and beyond the standard shipping costs are the responsibility of the customer. From time-to-time we may offer discounted and free shipping based on the value of your order and the shipping destination. Shipping discounts are automatically calculated based on the items in your cart. Free shipping orders are typically shipped using UPS Standard service, however we may choose a different shipping method based on the destination and value of your order. Discounted/Free Shipping offers may be discontinued at any time. Duties, import fees, or taxes assessed by your country's customs service or customs brokerage fees that are assessed by the carrier are the responsibility of the customer and are not covered by our discounted/free shipping offer. Postal shipping times provided on the Shipping Options page on our website are provided by Canada Post, are NOT guaranteed and can take longer on occasion. It has been our experience that while the shipping times provided by the post office are usually fairly accurate, there will be occasions were it will take longer. If you need your order be a specific date, we recommend that you use a UPS Expedited or Express option instead. Note that we are unable to initiate a lost package trace with the post office until the number of business days after the ship date as shown in the table below. We can ship to the United States via UPS. Shipments to the USA are usually free of duty and brokerage fees if the total order value is less than $800. Orders above this amount may require additional brokerage and duty charges which are collected by the shipping company at the time of delivery and are the responsibility of the customer. We can ship to Canadian destinations via UPS or Canada Post. Taxes are automatically added to all Canadian orders. HST will be applied to all orders being shipped to an address in Ontario. We can ship to almost any country in the World via UPS. Duties and brokerage charges may be assessed by your country's customs service and the shipping company. We can ship to the United States via Postal Service or UPS. We can ship to Canadian destinations via Canada Post or UPS. We can ship to almost any country in the World via Postal Service or UPS. Items marked as "Built to Order" are not kept in inventory. When an order for a built-to-order product is received, it is put into our production queue and produced in the order it was received. The amount of time this can take varies from product to product, will be influenced by our current work load, and can vary from a day or two, to several weeks. If you need an estimate as to how long it may take to produce a particular item, please feel free to send an email to service@fast-tracks.net. Don't hesitate to let us know if you need a particular item quickly. We make every effort to ship your order on time, however projected ship dates are not guaranteed. We cannot ship partial orders. Your entire order will be held until all items are available and then shipped as a single shipment. 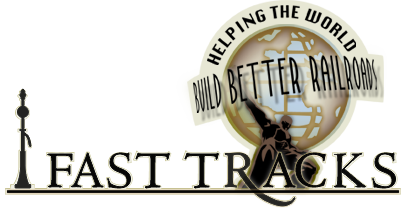 To expedite an order, please send an email message to service@fast-tracks.net We will do our very best to respond to your expedite request within 2 business days. All products are shipped FOB from our facility in Port Dover, Ontario, Canada. A refused shipment occurs when the customer refuses to accept the package during a delivery attempt. Customers who refuse delivery, and who do not contact Fast Tracks to obtain proper return instructions may be assessed a fee to cover return shipping and restocking costs. These fees will be deducted from any credit due to the customer for returned items. You may cancel any un-shipped, non-custom orders without penalty. If a non-custom item has already been shipped, you may return the item for a full refund less any shipping charges. You may only cancel custom ordered items if we have not started the build process. To cancel an order please send an email message to service@fast-tracks.net. You will find our returns policy and return shipping instruction here. We reserve the right to modify our Shipping Terms at any time without notice. This document was last updated on February 22, 2018.